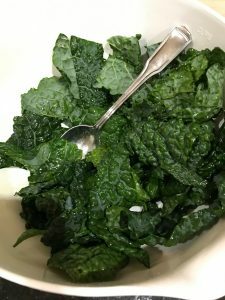 I know many of us call this recipe “Kale Chips” – but to me a “chip” is usually made of a root vegetable you can use for dipping into salsa or guacamole. 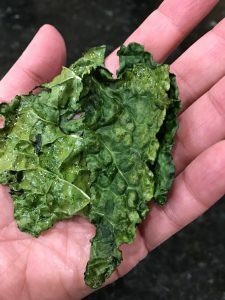 So, I’m naming my recipe Kale Crisps. I’ve started 2017 on a healthy kick, researching several recipes and ways to incorporate more whole foods in my diet. 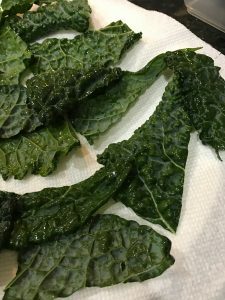 Thanks to Cooks Illustrated (subscription based magazine and online site), I am enjoying my easy to make Kale Crisps. Traditionally made in the oven, Cooks Illustrated researched and shared a recipe to make them in the microwave. Something I usually avoid – but found it to work really well.